April 22-25, 2010 ~ Plein Air artists gather in Wanye County (Goldsboro) to paint... DETAILS HERE. I have not gotten any response back from any OOPS members after sending this out at the beginning of the year. I assume no one is going... please let Becca know if you are planning on going... contact info on the DETAILS link. April 25, 2010 ~ Our monthly PAINT OUT @ 1PM... Location TBA. This date was selected so Phyllis Eaton Steimel and two other members of the group, Plein Air Carolina, can paint with us. Phyllis has be trying to coordinate dates to paint with us the past two years... this is a great opportunity to do so. We may leave the location up to Phyllis if she wants as long as it is in Onslow County. Phyllis Eaton Steimel Hi, Bernie, I will be coming to Camp Lejeune with two other plein air painters from April 22 to 26. Any chance you will have a paint out that weekend? We would love to join you! March 14, 2010 ~ Our Paint Out for March southside of the New River in downtown Jacksonville. Details HERE. October 2010 ~ Our Art Exhibit at the Council... we need to get busy painting scenes from Onslow County... Connie Wenner (Directer at the Council) is wanting up to 5 works per artist or at least one from every artist. MARCH 2010 Paint Out set for March 14th. WHERE: Between the Bridges (on the south side opposite from where we have painted from the Pelitier House) Downtown Jacksonville. You can actually turn into the location across from the old Fisherman's Wharf. WHY: Simply put... we LOVE plein air painting! Will be GREAT to get outside again! Congratulations go out to our own Patsy Lain who received a 2nd Placehonor in the Senior Games Art Contest last week for her "Home Sweet Home" painting which was of the Tarkil Branch homestead. WHAT: FREE Workshop for OOPS members by Bernie Rosage Jr. Due to limited space this workshop is only open to OOPS members. No sign up needed... If you are an OOPS member you're in! C O L O R for the plein air artist. Bernie will discuss hue, value and intensity, color temperature, color harmony with practical limited palette choices for the field, color mixing, compliments and graying/dulling color, we will navigate the color wheel in 3D to gain a better understanding of color mixing options, color mood, plus more! 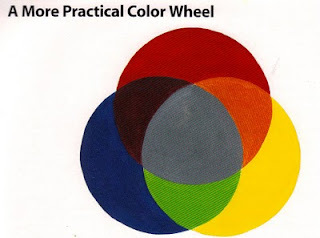 ** Bring one tube of any red, blue, yellow (primary colors) plus white for some in workshop color mixing exercises. Paper mixing palettes (paper plates) and mixing utensils (plastic knives) will be provided. Bring cleaning supplies needed for your medium. ** Bring a sketch pad to mix color samples on. ** Bring one of your finished paintings for group discussion on color from it the last 30 minutes of workshop. ATTENTION OOPS MEMBERS: Check out this email I got from Becca Scott Reynolds from the Arts Council in Wayne County... sounds pretty cool... let me know if anyone can attend. I met with one of your member, Mitchell Morton, this summer and really enjoyed talking with him when I became the Gallery & Education Director for the Arts Council of Wayne County. I told him that I would love to keep you all in mind to have an exhibit with us, or to participate in an event we have, and that you would be the contact to talk about that. There is an opportunity coming up that I think would be great for the OOPS members! The ACWC is hosting a show called “reinCARnation” that will feature sculptures done by metal workers and welders, that will be made on site at an auto salvage yard. I would LOVE to invite the OOPS group to come and paint scenes from the salvage yard, and paint the teams while they work. The work days will be April 22-25 here in Goldsboro. We plan to have the event open to the public on April 25, and possibly April 24 as well, with live remote broadcasts from TV and radio. We plan to exhibit the sculptures (and your group’s paintings if you choose to participate) in July 2010 in the lower level gallery here. If several members from your group would commit to participating, we would love to work with you all! Also, we have our Sunday in the Garden event in September of every year and that would be another great chance for the group to come and paint some really great scenes! This year it will be held in conjunction with the Smithsonians’ New Harmonies exhibit that celebrates American roots music! If you have questions or would like to participate please email me (becca@artsinwayne.org) or call me at 919-736-3300 (m-f 10-2) or 919-222-8566 (all other times)!! May 17-19 in New Bern. This workshop is guaranteed to loosen up your style and transform your art. Learn to paint with a loose, quick and impressionistic style by learning how to capture light effects, simplify objects, working quickly, color and composition theory, and color palate choices. Sign up by May 7, space is limited.